At the source served in a pint glass. The menu puts this at 6.1%. 3.5 A: Clear orange Amber color. Came with a head but I was preoccupied and didn't visualize it. No lacing left though. 4.0 S: Strong sugary sweet caramel with lots of pumpkin spice. It's so exaggerated that it reminds me of fruity pebbles or something of that nature. That isn't meant to be an insult though as it smells great. 4.0 T: Like the nose this has a heavy spiciness with thick sweet caramel. Pleasantly toasty. Good bit of pumpkin, vanilla, and brown sugar. 3.5 M: Heavier medium body. Good moderate carbonation with a pleasant creaminess. Super smooth. 4.0 D: Super tasty and plenty pumpkin-y. 16 oz. can poured into a Sam Adams Perfect Pint Glass. Liquid portion comes out a nice amber color with absolutely perfect clarity. Nice looking white head, mostly small bubbles with some medium sized ones worked in there. Goes away pretty quickly, and not much in the way of lacing. Good looking beer though, I really can't believe how clear it is. The smell is pretty good, a fair representation of the style. Not really too much to say about it, it just smells like pumpkin pie spices, nutmeg, cinnamon, and a hint of vanilla. Taste is a step up from the smell. The smell is more just the pumpkin pie spices, which are present in the taste too, but it actually tastes like beer too. Nutmeg and cinnamon slightly present in addition to some earthy mashed pumpkin. Decent malt backbone and a hint of hops. At the end there is a finishing flavor of some vanilla. Mouthfeel is pretty good, medium bodied I'd say. Pretty smooth with a slight earthy tone. Starts sweet and maintains most of the way through, a nice warming finish. Good carbonation level and slightly consistent with the typical pumpkin beer mouthfeel. Very drinkable beer, goes by pretty quick. Not the biggest pumpkin beer fan in the world, but I enjoyed this one. Pounder can poured into a snifter appears s clear copper color with a white head that is quick to fade leaving spotty lace. The smell contains that of pumpkin flesh right out the gate with a mild vegetative feel and some hints of spice like big red gum. The flavor is mildly vegetative and carries with it a bit of pumpkin flesh and green yeastiness. A little bit of herbal bitterness to the finish with faint spicing. This is light bodied and modestly carbonated. Overall not bad pumpkin beer. I like how it captured the essence of the pumpkin flesh and was not an over-spiced mess. A little reworking of the recipe could really turn this into something special. Very mild vegetal aroma, not really pumpkin but maybe cooked squash. Taste is watery with a weak malt flavor. Minimal pumpkin and even less spice. The hop bitterness predominates in the finish. The adorable can is the best thing about this beer. Pity the brewing isn't as good as the marketing. A - Off to a great start a 1/2 inch of opaque colored head that seems to stick around forever with great lacing. Color is a Nice bright orange yellow color rather dark but clear. S - Not overbearing with spices mild brown sugar and vanilla if anything its mostly bright pumpkin flesh with a vegital squash smell. T - To me it needs more sweetness from the vanilla and more spice. It does taste rather pumpkin which is good I guess. Very traditional After a few sips my palate does adjust to the vegital taste and it taste rather good. M -Despite the lower than average ABV it does taste rather good. Light to medium yet the body is not too watery. Overall I was sort of impressed with this as my first offering from Old Forge Brewery but with little spice or sweetness its not overly interesting but its not "uber hopped" which I appreciate. Above average overall. Poured this from a can into a glass, it has a nice bright goldlen orange color body with a small bubbley head, that quickly disappears. The smell is basic, pumpkin pie spices with a hint of vanilla and some brown sugar. The taste is like the smell just the vanilla is a little more noticable. It is well balanced of the pumpkin and spices. The mouth feel is great, and overall it is a above average pumpkin beer. S-smells grainy with a slight touch of pumpkin mash. honestly smells more like a german lager than an ale. smells okay. T-comes in with a great flavor of grains, pumpkin, and a touch of vanilla. it's actually quite a bit of flavor for the low abv. the after-taste is matching with more pumpkin coming out, there's even a touch of bitterness. O-considering it comes in tall boy cans, this might be the perfect campfire beer this autumn. it's truly a great pumpkin ale, it doesn't have the crazy flavor of some, but it's far more drinkable than most. there are no off flavors. I dare say this might please those who won't drink pumpkin beers. Appearance – The beer pours a nice orange-reddish-amber color with a very foamy head of 2.5 fingers. The head fades rapidly at first but, at about one finger, persists for a few minutes more. Once the persistent foam head fades, it leaves a nice level of foamy lace on the sides of the glass and some foam islands on the surface of the brew. Smell – The aroma is of a roasted pumpkin smell with some bready aromas mixed within. Along with these smells are some spice aromas of clove and nutmeg as well as a light cinnamon and a little bit of brown sugar and caramel. Overall a nice balanced pumpkin ale aroma. Taste – The taste begins with a bready and lightly roasted pumpkin flavor at the front. Along with these flavors are some lighter caramel tastes sweetening the brew ever so lightly. The caramel fades as the taste moves on with some spice flavors of a clove and nutmeg coming more toward the middle of the taste. Some of the caramel returns more toward the end of the taste along with some brown sugar as well. With these sweeter flavors coming, the once lighter roasted pumpkin taste takes on a much more roasted flavor. With a decent sum of cinnamon and a light herbal and earthy flavor coming to the tongue at the very end, one is left with a lightly sweetened, nicely roasted, and moderately spiced flavor to linger on the tongue. Mouthfeel – The body of the beer is a bit on the thinner side with a carbonation level that is average to above average for a growler pour. The carbonation level is quite nice for the roasted pumpkin flavors and the lighter sweetness of the brew, although a bit more body thickness may have helped all the flavors around a bit more. With that said while at only 4.6 % abv., the mouthfeel is actually quite good overall. 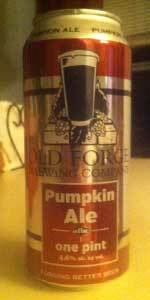 Overall – This is likely the best pumpkin session beer I have ever had. While not a super flavorful powerhouse like many of the pumpkin brews out there (imperials in particular) it packs tons of great flavor and a wonderful drinkability into a very modest 4.6 % abv. Perfect for sipping on a nice autumn day watching football and chatting with friends.